Abstract: The earliest attempts to mass-market romance fiction to American women readers in the late nineteenth century were more likely to fail than to flourish. This essay examines the first romance-centered dime novel and story paper series in order to reconsider this puzzling failure, which previous critics have often blamed on either the underdeveloped tastes or inadequate purchasing power of women readers. Paying special attention to Belles and Beaux, the first romance story paper issued by the publishing house of Beadle and Adams—and in particular to the reading environment shaped by the paratextual material appearing alongside the series’ popular love stories—I argue instead that the publishers and editors of the early romance periodicals lacked the courage of their own convictions, routinely diluting or even undermining the very ethos of romance that their publications were, in theory, designed to provide. Not until publishers gave women readers what they had been promised—periodicals unreservedly committed to the project of romance—did mass-marketed romance finally flourish in the U.S.
About the Author: William Gleason is Professor of English and Acting Director of American Studies at Princeton University. He is the author of The Leisure Ethic: Work, Play, and American Literature, 1840-1940 (Stanford University Press, 1999) and Sites Unseen: Architecture, Race, and American Literature (New York University Press, 2011). The mass marketing of modern romance fiction in North America began not with the emergence of Harlequin Books in the 1950s but during the dime novel and story paper boom of the 1860s and 1870s. Seeking to capitalize on the longstanding appeal of love stories, which had been appearing alongside other popular genres in the weekly family story papers since the mid-nineteenth century, many of the most influential “cheap” U.S. publishing houses—including Beadle and Adams, Street and Smith, George P. Munro, and Norman Munro—began to experiment with more distinctly marked romance series aimed primarily or exclusively at women readers. Several of these series were quite successful, others wildly so. Beadle and Adams’s Waverley Library, for example, which offered both classic fiction and popular romance novels, produced a total of 353 issues between 1879 and 1886 (Johannsen 304, 314). Street and Smith’s Bertha Clay Library, launched in 1900, ran (along with its successor, the New Bertha M. Clay Library) for more than thirty years (Carr 81). And from the mid-1880s through the 1930s popular publishers fought over exclusive rights to publish and republish the works of prolific American romance novelist Laura Jean Libbey, both as stand-alone volumes in various “library” series and as serialized novels in weekly story papers (Masteller 205). These late nineteenth- and early twentieth-century publishing successes laid the groundwork for the mass marketing of popular romance with which we are familiar today. Understanding this inaugural phase of the production of American romance fiction as an independent genre is thus critical to any fuller investigation of the literary and cultural history of popular romance. Although haphazardly archived by libraries and all but overlooked by literary history, the romance dime novels and story papers of the late nineteenth and early twentieth centuries have slowly begun to receive much deserved scholarly attention. In this essay I examine the experimentation described above: the initial attempts by cheap fiction publishers to market romance as a distinct genre to women readers. Rather than focus on the eventual successes, however, I consider the early—and repeated—failures. For despite the backing and expertise of some of the most powerful popular publishing concerns of the day, as well as the demonstrated appeal of romance fiction to nineteenth-century women readers, the first romance-centered dime novel series and story papers were more likely to fold than to flourish. A variety of explanations have been ventured for these failures. In his landmark bibliographic study of the publishing firm Beadle and Adams (whose introduction in 1860 of the first continuous series of fixed-price popular books effectively created the hugely successful concept of the “dime novel”), Albert Johannsen nominates price sensitivity as one factor. When in 1869 Beadle and Adams launched the predominantly romance-focused New Twenty-Five Cent Novels series, for example, Johannsen surmises that the publishers misjudged the willingness of readers in the dime novel era to pay more than ten cents for cheap fiction (165). The series, which published a complete novel in every issue, folded after only four numbers. Felicia Luz Carr has similarly argued that, for working-class women in particular—the primary audience for dime novel and story paper romance fiction—every expenditure for entertainment, including popular fiction, had to be carefully justified (67). And yet even low-priced romance serials, at least initially, fared little better. Indeed, the first three inexpensive romance story papers marketed aggressively to women readers—Beadle and Adams’s Belles and Beaux and Girls of Today, and Norman Munro’s The New York Weekly Story-Teller, all published between 1874 and 1877 for no more than ten cents an issue, each of which offered lengthy installments from at least two, and sometimes up to five different romance novels—failed to thrive. In accounting for these puzzling disappointments scholars have blamed both publishers and readers. Noting that the absence of business records for Beadle and Adams makes definitive judgment difficult, Carr tentatively lays the failure of Belles and Beaux—launched in 1874 as the first story paper focused exclusively on romance but which lasted only thirteen issues—on editorial impatience. “Three months is hardly sufficient time to develop a readership,” observes Carr, “but it seems Beadle and Adams were against risking capital on a venture that did not produce an immediate return. [ . . . ] Rather than develop an audience slowly, they opted to end the experiment” (73). Taking a slightly different tack, Johannsen speculates that the highly gendered content of Belles and Beaux, aimed primarily at women despite the titular invitation to readers of both sexes (belles and beaux)—limited the scope of its potential audience. The journal did not pay, in other words, because “it was too ladylike an affair to appeal to young men” (60). Both these explanations assume that a predominantly female audience could not be counted on to support a story paper or dime novel series—at least not quickly, and not in large enough numbers to sustain a profitable business model. In evaluating the equally disappointing failure of Girls of Today, Beadle and Adams’s 1875 follow-up venture to Belles and Beaux, Johannsen and Carr lay specific blame on female readers. “Girls alone, apparently,” Johannsen asserts, “could not be depended upon to support the journal” (470). Carr suggests that working women may not yet have been capable of conceiving themselves as a targetable audience in the first place. “It seems that Beadle and Adams were just a bit ahead of the times in their attempt to reach an all female audience, or that they were in the process of developing an audience who did not quite think of themselves as a specific group of readers,” she concludes. “The fact that the paper ran stories similar to those that appeared later in successful book series, such as the Eagle Library, suggests that the failure of Girls of Today was not due to insufficient writing talent or the selection of unpopular tales” (74). Indeed, Carr argues that the eventual success of dime novel and story paper romance fiction should be attributed to the astuteness of the publishers, who “succeeded in creating not only a new genre of women’s books, but also a corresponding demand for it” (18). In the pages that follow I question the assumptions that women readers were a leading cause of the early failures of the romance dime novel and story paper series and that mass-market romance could only flourish once astute publishers created a demand for it. My analysis suggests that the editors and publishers of the earliest romance dime novel and story paper series repeatedly misjudged their audience, conspicuously failing to give women readers enough not only of what they desired but of what they had been promised—and were more than ready to buy. I draw my evidence primarily from the three failed romance story papers mentioned above—Belles and Beaux, Girls of Today, and The New York Weekly Story-Teller—with special emphasis paid to Belles and Beaux as both the first paper of its kind and a model for the failures that followed. Against Johannsen, for example, I argue that Belles and Beaux failed not because it was “too ladylike” but because it wasn’t “ladylike” enough. Though marketed as one-stop shopping for romance—“Tales of [Cupid’s] doings deftly told / Shall charm these pages week by week,” announced the front page of the inaugural issue (“Belles and Beaux, Greeting,” lines 41-42)—Belles and Beaux (like its imitators) was packaged with material that not only had nothing to do with “Cupid’s doings” but at times attacked, even misogynistically, the very idea of romantic love. In contrast to Carr, I do not believe women readers had to be convinced they existed as a specific group in order to purchase romance story papers. Instead I argue that women readers quite astutely recognized that periodicals like Belles and Beaux, Girls of Today, and The New York Weekly Story-Teller were simply not giving them their hard-earned money’s worth and decided to withhold their dimes until they found publications that did. Although there was much in these early story papers that affirmed the power of romance, and although editors often went to significant lengths not merely to provide love stories but also to foster what I term “practical romance” in readers’ own lives, trial purchasers of Belles and Beaux and its followers could not have helped but be disappointed by the anti-romantic elements that routinely appeared in every issue—elements that may not always have been front and center (though sometimes they were) but that nonetheless contributed crucially to the overall reading experience. Reader dissatisfaction, not an inability to recognize themselves as a target audience, I argue, sent these early periodicals to their printer’s graves. The publishers and editors of the early romance dime novels and story papers were certainly astute enough to recognize the profit potential in turning romance into a stand-alone genre. During an era in which print culture more generally was rapidly stratifying into separate “brows” (high-, middle-, and low-), each with different target audiences and expectations, the decision by cheap publishers to supplement the broadly successful family story paper (with its multiple departments and “something for everyone” approach) with series focused more narrowly on the interests of a particular gender, for example, would seem to have made good business sense. But in the case of romance fiction, these publishers appear, in their initial experiments, to have lacked the courage of their own convictions. Instead of committing unreservedly to the project of romance, they hedged, filling the spaces around the serialized love stories with collateral materials that at times mocked their readers’ own desires. Indeed, by voting with their dimes women readers showed story paper editors that this paratextual material—what literary critic Christopher Looby has helpfully described as “the variety of devices and conventions that surround a text and mediate between it and its readers” (182)—mattered as much as the love stories themselves. Romance buyers, it would appear, demanded a coherent reading environment. They were unwilling to commit to series that were themselves unwilling to commit, wholeheartedly, to romance. As we will see, only when story paper publishers agreed to give women readers what Belles and Beaux had initially promised—and not before—did the first mass-marketed romance series finally flourish. With its intrinsic rhythm of desire and delay and its rejection of the traditional comedic courtship plot (in which the hero falls in love at first sight) in favor of what Pamela Regis has identified as the romance heroine’s story of “slowly developing love” (57), romance fiction was particularly well-suited to the narrative cycles of serial publishing. One of the earliest and most successful family story papers to incorporate romance, for example, was Robert Bonner’s New York Ledger, which ran from 1855 to 1898. Devoted, as its masthead announced, to “choice literature, romance, the news, and commerce” (Cox 190), this large eight-page weekly saw romance as one among many genres through which to appeal to a family audience. The term “romance” itself was deployed broadly in Bonner’s paper, describing not merely stories of (female) love and courtship but also (male) adventure and daring. But Bonner’s success at attracting women readers—particularly young women readers attracted to the works of romance novelist E.D.E.N. Southworth, who was under exclusive contract to the Ledger—is likely what led several of the leading story paper houses to try their hands in the mid-1870s at more narrowly focused periodicals targeting a primarily female readership. And wise may either shun or seek. Fig. 1. 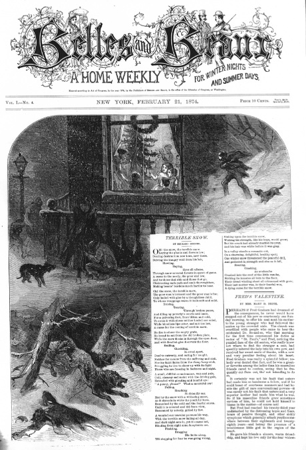 Belles and Beaux: A Home Weekly for Winter Nights and Summer Days 31 January 1874: 1. Courtesy Rare Books and Special Collections, Founders’ Memorial Library, Northern Illinois University. By any count, “Cupid’s doings,” “soft hopes,” and “dreaming hearts” constitute a significant percentage of the weekly contents of Belles and Beaux. Readers of the first issue were treated, for example, to initial multi-chapter installments from three different long romantic fictions, including The Rothcourt Heir; or, Betrothed at the Cradle, an English love story “by the author of ‘Of High Degree,’ etc.”; Alida Barrett; or, The Door in the Heart, by Mrs. E. F. Ellet; and Kate Darling; or, The Belle of the School (listed without an author but now known to be from the pen of Canadian romance novelist May Agnes Fleming). In addition to these featured installments, readers would have found in this issue a selection of poems devoted to love, as well as two short love stories, Lucille C. Hollis’s “How Cora Went to Europe” and Henri Montcalm’s “Bertie’s Tutor.” These short stories are notable in part for their differing points of view: though both written in the third person, Hollis’s tale is focalized through the eyes of a young woman, Montcalm’s through those of a young man. Perhaps befitting the paper’s declared interest in belles and beaux, this attention to both male and female perspectives on falling in love would become characteristic of the periodical even in its short publishing span (and despite the fact that many more female writers would be published in its pages than male ones). The editors of Belles and Beaux also made a discernable paratextual effort to create a romantic environment for its readers, male and female, both within and outside the paper itself. In using the term “paratext” I draw on the work of narratologist Gerard Genette, who highlights the ways in which such liminal elements as titles, epigraphs, dedications, prefaces, jacket copy, promotional blurbs, and the like, “mediate” a book to its reader (Macksey xviii). Although Genette restricts his analysis to books, Looby has demonstrated how paratextual theory may be applied to nineteenth-century story papers through his examination of Southworth’s serialized novels in Bonner’s New York Ledger. In these periodicals, Looby suggests, the paratext includes not only the publishing apparatus but also the adjacent texts and topics that share physical and ideological space with the serialized romance stories: that is, the poetry, advertisements, illustrations, letters to the editor, and so on—materials Looby colloquially terms “the rest of each issue” (186). All these elements “impinge influentially upon our reading experience,” Looby argues, by “soliciting our attention to particular texts (or portions or details of texts), preforming our horizon of expectations, guiding our reading as it transpires, and otherwise governing our understanding of the text in remarkably powerful, if often unnoticed, ways” (182). Fig. 2. “Love May Change, But Dieth Not.” Belles and Beaux: A Home Weekly for Winter Nights and Summer Days 31 January 1874: 16. Courtesy Rare Books and Special Collections, Founders’ Memorial Library, Northern Illinois University. Alongside these overt inducements to “practical” romance, the paratextual apparatus of Belles and Beaux also evinced a decided interest in global and comparativist perspectives on love. The paper frequently provided articles and anecdotes, for example, on women’s matrimonial lives around the globe, including such diverse social practices as Polish weddings, German trousseaus, and Indian polyandry. More than the literary materials, these short non-fiction pieces were typically narrated from a woman’s point of view. Indeed, only women wrote regular columns for Belles and Beaux, not men, giving these portions of the paper, though ostensibly targeted to both genders, the feel of a woman-centered environment in which female readers might safely and perhaps instructively calibrate their own social, romantic, and/or sexual identities against a wide range of possibilities. Despite the breadth of attention paid in the pages of Belles and Beaux to the discussion, depiction, and performance of love, however, in many other ways, both subtle and obvious, the story paper’s editors seemed unwilling to commit themselves to romance without reservation. They betrayed this reluctance in part by including, from the very first issue, substantial material with only tangential connection to love—or in some cases, with no direct link whatsoever. The inaugural issue, for example, includes a multi-column article on the increasingly common use of fake jewelry. Although jewelry has, of course, long played an important role in courtship, this particular article expresses little interest in either the practical or ethical implications of ersatz ornament for modern romance, focusing instead, almost clinically, on the chemical processes that turn cobalt oxide into sapphire necklaces (“Sham Jewelry” 6-7). Later in the same issue the reader is offered a lengthy discussion of “National Songs.” Here, too, although the article briefly notes an evolution in European balladry from songs of war to “warbl[ings] of love and home,” and mentions in passing the “beautiful” love songs of the French Troubadors (“National Songs” 14), the article’s main concern lies with old tunes, usually military in origin, that have worked their way so deeply into the consciousness of nations that they are known by persons of all ages and classes. The miscellaneity of these weekly columns affirm the “something for everyone” family paper origins of the story paper romance series. Bonner’s New York Ledger, for example, often interspersed short pieces on a variety of unconnected topics among its serial installments. Bonner also included a weekly “Notice to Correspondents” in which the editors answered reader mail, a common family story paper feature imitated in Beadle and Adams’s own Saturday Journal (launched in 1870) and mimicked in the “Letter-Box” column of Belles and Beaux. Like many other elements of Belles and Beaux, the “Letter-Box” also commingled the romantic with the non-romantic. Indeed, for every response offering valuable courtship advice (Should I run away with my betrothed, who has had an unexpected financial reversal, against my parents’ wishes? Answer: No), there are braces of mundane questions whose solutions promise to quicken no lover’s pulse. “Can a railroad ticket bought a week ago and marked ‘Good for this day only,’ be used next month, as unexpected detention will prevent its use until that time?” urgently inquires one correspondent in the same issue. The surprising, if not especially romantic, answer: Yes (“Letter-Box,” 21 February 1874, 8). Of course merely tallying up the non-romantic column inches in this early, failed romance paper seems rather cold calculus for gauging the potential frustrations of readers paying ten cents a week for a periodical that was supposed to be uniquely focused on the ways of Cupid. After all, family story paper editors, often desperate for copy and averse to paying for new material unless absolutely necessary, had always filled out their weekly issues with miscellany and recycled content. But if that strategy fit neatly with the eclectic appeal of the family papers it was not necessarily well suited to the more tightly focused audience of the romance papers. 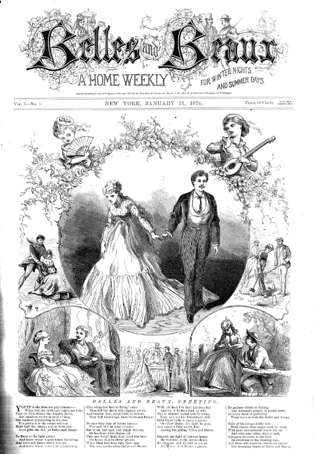 While it is possible the editors of the romance weeklies simply lacked sufficient material of a romantic nature to include, the eventual success of a romance story paper like George P. Munro’s New York Fashion Bazaar—which first appeared in 1879 and whose paratextual materials (fashion plates, gossip columns, and sheet music) seem to have been more coherently calibrated to the anticipated desires of female readers—suggests it should have been possible to align paratext to primary text in the mid-1870s as well. To identify a better measure of the self-sabotaging failure of a periodical like Belles and Beaux, then, we need to look elsewhere—not at what I have been calling the non-romantic elements, but instead at what might best be termed the anti-romantic ones. Often although not exclusively written by men, these are the bits and pieces that mock, undermine, or even reject the idea of romance itself, elements that seem designed to make a reader question rather than embrace the possibility of true love, and perhaps even wonder why he or she has spent good money on a magazine that belittles its readers’ own desires. An even more scathing indictment of certain women as potential marriage partners concludes the third issue. Titled “Poor Wykhoff Jones,” and appearing in place of the customary sheet music on the back page of the paper—in itself a surprising substitution for a journal trying to establish a sense of continuity and readerly expectation—Metta Victor’s three-part narrative poem chronicles the life (and death) of a young man who marries a wealthy older woman. In Part I, “The Courtship,” romance flourishes: “They had stolen apart from the careless crowd, / Whose heads were whirling with waltz and wine” (lines 1-2). In Part II, “The Marriage,” the couple unites. But by Part III, “The Result,” the older woman is revealed not as a passionate lover but a vampiric killjoy who reneges on the promises she has made to support Jones in the style to which he has become accustomed. Rather than decry the motives of both lovers, the poem focuses solely on the indignities visited upon the emasculated trophy husband by his aged, domineering benefactress—a perspective reinforced by the illustrations that accompany the poem (see fig. 3). In the final lines of Part III, the despondent Jones finally commits suicide by hanging himself with one of his tormentor’s apron strings. Fig. 3. Illustration for “Poor Wykhoff Jones,” Belles and Beaux 14 February 1874: 16. Note the self-satisfied leer on the bride’s aged face in this wedding-day snapshot, in contrast to the frustrated pout of “poor” Jones, making it clear where the sympathies of the viewer should lie. Courtesy Rare Books and Special Collections, Founders’ Memorial Library, Northern Illinois University. A very different but equally prominent anti-romantic gesture in Belles and Beaux, particularly in the early issues, may be found in stories that do not end in a proposal or marriage but in death or tragedy. These stories may include romantic elements, but they are not fundamentally about the power of love; indeed, they seem instead to highlight the failure of love to make a meaningful difference in the world. Bizarrely, both the second and third issues of Belles and Beaux place one of these stories—always complete in a single issue, not serialized—in the most prominent possible position: front and center on page one. The cover story of the second issue, for example, Frank H. Norton’s “The Diamond-Dreamer,” offers a Poe-esque tale of alchemy and death. Told in the first person by a young professor of chemistry who has taken up new lodgings close to the college at which he has been hired to teach, the story describes the professor’s discovery of a secret process by which to turn charcoal into diamonds. Revealed to him by a beautiful young female somnambulist—the daughter of a chemist who used to own the very house in which the professor has taken rooms—the secret process succeeds beyond the professor’s wildest dreams while simultaneously draining the life out of the young woman and also the professor himself. Realizing this danger too late to avert tragedy, the “terror-stricken” (3) professor recounts for the reader the sudden death of the maiden only moments before he too succumbs to the mysterious dark force of this strange magic. (His first person narration is literally interrupted in mid-sentence.) A coda to the story, told by an unidentified third person narrator, describes “thousands of glittering gems” scattered around the “ghastly corpses” (3) on the professor’s floor silently transforming themselves back into charcoal. Although the tale suggests that the souls of the professor and the maiden will be united in “the world to come” (3), “The Diamond-Dreamer” is fundamentally a story of the destructiveness of obsession, not the eternity of love. How strange it must also have been for readers expecting the “pure enchantment” of “Cupid’s doings” to find on the cover of the third issue—the Valentine’s Day number, no less—“Luriel: A Story of the Sunshine Islands” (see fig. 4). A tale of a woman driven insane by the murder of her beloved at the hands of her own father when she refuses to marry the husband he has picked out for her, “Luriel” (written by frequent contributor Eben E. Rexford, also the author of the misogynistic poem “A Youthful Fancy”) invokes the agony of true love denied without ever granting its heroine relief from her emotional pain. Like a female Ancient Mariner, Luriel corners every visitor to the madhouse in which she has been committed to tell them her story and beg for news of her beloved, whom, in her delusion, she believes is still alive. “I have been here hundreds and hundreds of years,” she tells one listener. “I shall never die till Rupert comes for me. He will come sometime. He said he would” (2). But as the story makes clear, Luriel will never leave her asylum nor be reunited with her lover. She is an object of fascination not for her devotion but for the elaborateness of her dementia, fervently believing she is from the “Sunshine Islands,” that Rupert is a prince, and that she has been exiled from her native land—though the story makes clear she is merely a planter’s daughter from one of the southern states. 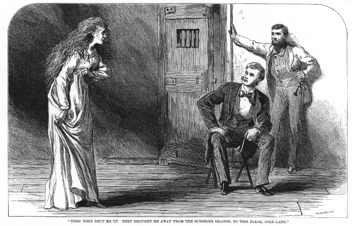 The stark half-page cover illustration, which depicts Luriel as a bedraggled lunatic telling her story to two men who look on, impassively, further affirms that she should be regarded with pity rather than admiration. Fig. 4. Cover illustration for “Luriel: A Story of the Sunshine Islands,” Belles and Beaux 14 February 1874: 1. Courtesy Rare Books and Special Collections, Founders’ Memorial Library, Northern Illinois University. Fig. 5. Cover page with illustration for “Terrible Snow.” Belles and Beaux 21 February 1874: 1. Courtesy Rare Books and Special Collections, Founders’ Memorial Library, Northern Illinois University. Although the editors of Belles and Beaux follow “Terrible Snow” with a short love story, I suspect that if you covered up the masthead of this number, with its snarling wolves, and that of the paper’s inaugural issue, with its romantic collage of courtship, love, and matrimony—and then handed them to an unsuspecting reader—that reader would be stunned to discover they were from the same periodical. Not until the fifth issue, with the introduction of a new serialized romance novel, “The Maddest Marriage Ever Was,” does Belles and Beaux once again put romantic love on the front page. The paper may have promised readers to be the source “for gay romance— / When feet are swift and hearts are true” (“Belles and Beaux, Greeting” lines 1-2), but some of the most prominent contents of the early issues tell a very different, and at the least, a very conflicted, tale. It is not difficult, under the circumstances, to imagine even the most devoted readers of romance wondering, and wondering quickly, whether their weekly dime should be spent somewhere else. For their part, the editors of Belles and Beaux often strained to give the impression they were delivering a more consistent product. Every so often the paper would evoke an image of itself for readers that closely mirrors the promises of the cover page of the first issue. 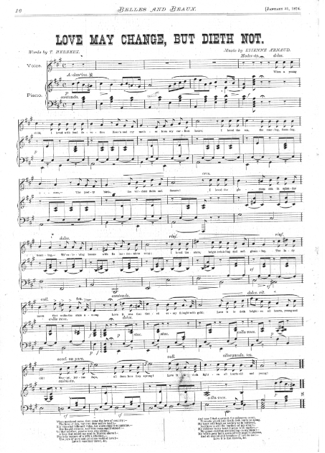 The sheet music on the back page of the same issue that opens with “Terrible Snow,” for example, is a work for piano titled “Belles and Beaux Fantasia,” at once a celebration of the pleasures of courtship and romance and by implication of the paper itself. More explicitly, the seventh number includes a poem titled “Belles and Beaux” that describes the ecstatic “delight” (Hazard, line 6) with which readers—and particularly women readers, “the fair ones” (5)—have supposedly embraced the “charming” periodical (8). “Oh, how their eager fingers / Flit o’er the rustling page!” the poem exclaims (9-10). In a short piece in the ninth number, titled “Our Poets,” the editors praise the verse published in Belles and Beaux for communicating the “sweetest thoughts” to those readers to whom the paper especially “caters”: “those who love and are beloved” (8). Where a poem like “Terrible Snow” fits into this self-image is anyone’s guess. At times one wonders whether the paper’s editors read all the material they published with equal care. In the “Letter-Box” of the fifth number, for example, a female columnist counsels a young woman reader in no uncertain terms that dying her hair blond is dangerous folly. “If you are really silly enough to wish to destroy the color of your hair,” she writes, “there are plenty of dyes advertised, but we can not indorse [sic] any from our own experience” (“Letter-Box,” 28 February 1874, 15). Directly opposite this advice, in the lower right corner of the same page, however, is a large advertisement for none other than “Aurora” hair dye—“for quickly imparting a rich golden flaxen shade to hair of any color.” Such juxtaposition confirms that editorial coherence was not the periodical’s main priority. The Best Paper for Ladies in the World! And yet, like Belles and Beaux, Girls of Today retained the non-romantic eclecticism of a family paper from the start, mixing love stories and poems with weekly columns and other materials designed to appeal to a broader readership. After only thirteen issues, Beadle and Adams began to reformulate the paper in an attempt to reach a wider audience than just women. They tinkered first with the title, adding The New York Mirror above Girls of Today in the fourteenth issue, which then morphed in the following number into The New-York Mirror: A Journal of Romance (with Girls of Today printed faintly above the new title). By issue sixteen, the designation “Girls of Today” had disappeared from the paper entirely, part of a new strategy, the editors explained, to appeal “to all classes, interests, and readers” (Johanssen 470). Instead of reaching a wider audience, however, what had begun as Girls of Today folded after five months in May 1876. In much the same way, Norman Munro’s New York Weekly Story-Teller—first issued in November 1875 as the self-proclaimed “Best Paper for Ladies in the World!”—also gradually forsook its woman-centered approach. Hedging its bets from day one, the Story-Teller promised to attend “to the wants of ladies” more assiduously “than any paper or magazine published in the United States” while assuring purchasers that each issue would also contain “plenty of other matter thrown in to please everybody” (“Best Paper”). Eventually forsaking romance for heavy doses of mystery and detective fiction, the Story-Teller soon shifted gears entirely, marketing itself to young boys by promoting installments like the adventures of “Big-Mouthed Billy” even as it still claimed, emptily, to be “The Best Paper for Ladies in the World!” Though it lasted longer than either Belles and Beaux or Girls of Today, Munro’s paper still folded after fewer than eighteen months. To argue that these papers failed because their publishers were “ahead of the times” in seeking a predominantly female audience for a romance-centered story paper before such an audience had come into being ignores the signal differences between these failures and the more successful romance series that would emerge at the end of the decade. The periodicals that thrived in 1879 and beyond, like George Munro’s New York Fashion Bazaar, were those that gave readers seeking romance no reason not to buy them. Beadle and Adams finally embraced this strategy in 1879 with their introduction of Waverley Library, which gave readers a single long form romance story in each weekly issue without any of the non- or anti-romantic elements of Belles and Beaux, Girls of Today, or the New York Weekly Story-Teller. Priced at a nickel—“A Fifty Cent Novel for Five Cents!” (Johannsen 304)—this new series finally offered women not simply what they wanted but what they had initially been promised, and at the right price. Rather than fault readers for failing to recognize their own desires, it thus seems more plausible to wonder whether the publishers were either too wedded to the family paper model and its textual and paratextual potpourri of “something for everyone” or too nervous to commit wholeheartedly to what they may have thought was a risky venture—even going so far, as we have seen in the case of Belles and Beaux, to sabotage the romantic aura of an otherwise innovative periodical by aiming, consciously or unconsciously, anti-romantic missiles at love itself. Rather than regard these periodicals as failed experiments, in other words, we might better see them as poorly designed experiments in which popular publishers learned, from their own readers, that paratext matters. In the end, what is striking about this literary history is the way it also mirrors the stutter-step emergence of mass-market romance publishing in the twentieth century. At its founding in 1908, British publisher Mills & Boon printed “anything it could lay its hands on—fiction, politics, humor, health, child care, cooking, travel,” turning exclusively to romance only in the 1930s (McAleer 17). In similar fashion, Harlequin Books, which opened its doors in the 1940s as a multi-genre reprint house, only committed to romance a decade later in the late 1950s (Regis 156). These histories suggest that, when it comes to love, even the most successful publishers have had to be brought around to the realization that all romance, all the time, was a winning business proposition—and that women readers could be counted on as consumers. Perhaps it should thus come as little surprise that the success of the first nineteenth-century romance story papers would come only after a series of failures. For what we find when we look at the very earliest attempts to market romance to American women in the nineteenth century are the same hesitations exhibited by publishers in the twentieth century, including the refusal to commit, in the first place, to the project of romance itself. 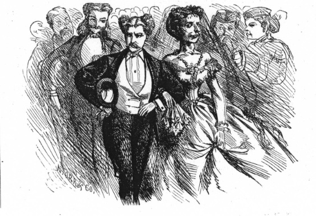 “Belles and Beaux, Greeting.” Belles and Beaux 31 January 1874: 1. Print. “The Best Paper for Ladies in the World!” Advertisement. New York Weekly Story-Teller n.d.: n.p. Print. Brodhead, Richard H. Cultures of Letters: Scenes of Reading and Writing in Nineteenth-Century America. Chicago: University of Chicago Press, 1993. Print. Carr, Felicia Luz. “All for Love: Gender, Class, and the Women’s Dime Novel in Nineteenth-Century America.” Diss. George Mason University, 2003. Ann Arbor: UMI, 2003. Print. Cox, J. Randolph. The Dime Novel Companion: A Source Book. Westport, CT: Greenwood Press, 2000. Print. Denning, Michael. Mechanic Accents: Dime Novels and Working-Class Culture in America. Rev. ed. London: Verso, 1998. Print. Gerner, Richard. “Terrible Snow.” Belles and Beaux 21 February 1874: 1. Print. Harper, S. M. “A Farewell.” Belles and Beaux 4 April 1874: 12. Print. Hazard, Hap. “Belles and Beaux.” Belles and Beaux 14 March 1874: 5. Print. Johanssen, Albert. The House of Beadle and Adams and its Dime and Nickel Novels: The Story of a Vanished Literature. Vol. 1. Norman: University of Oklahoma Press, 1950. Print. “The Letter-Box.” Belles and Beaux 21 February 1874: 8. Print. “The Letter-Box.” Belles and Beaux 28 February 1874: 8, 15. Print. Looby, Christopher. “Southworth and Seriality: The Hidden Hand in the New York Ledger.” Nineteenth-Century Literature 59.2 (2004): 179-211. Print. Macksey, Richard. Foreword. Paratexts: Thresholds of Interpretation. By Gerard Genette. Cambridge: Cambridge University Press, 1997. Print. Masteller, Jean Carwile. “Serial Romance: Laura Jean Libbey and Nineteenth-Century Story Papers.” Dime Novel Round-Up 74.6 (December 2005): 205-16. Print. McAleer, Joseph. Passion’s Fortunes: The Story of Mills & Boon. Oxford: Oxford University Press, 1999. Print. Mott, Frank Luther. A History of American Magazines, 1850-1865. Vol. 2. Cambridge, MA: Harvard University Press, 1938. Print. “National Songs.” Belles and Beaux 31 January 1874: 13-14. Print. Norton, Frank H. “The Diamond-Dreamer.” Belles and Beaux 7 February 1874: 1-3. Print. “Notice.” New York Weekly Story-Teller 12 June 1876: 8. Print. “Our Paper.” Belles and Beaux 31 January 1874: 8. Print. “Our Poets.” Belles and Beaux 28 March 1874: 8. Print. “The Revolt of the Flowers.” Belles and Beaux 31 January 1874: 14. Print. Rexford, Eben E. “Luriel: A Story of the Sunshine Islands.” Belles and Beaux 14 February 1874: 1-2. Print. —. “A Youthful Fancy.” Belles and Beaux 31 January 1874: 5. Print. “Sham Jewelry.” Belles and Beaux 31 January 1874: 6-7. Print. “Suicide of Nine Chinese Girls.” Belles and Beaux 7 February 1874: 14. Print. Victor, Metta. “Poor Wykhoff Jones,” Belles and Beaux 14 February 1874: 16. Print. I wish to thank Lynne M. Thomas and the curatorial staff of Rare Books and Special Collections in the Founders’ Memorial Library at Northern Illinois University for providing me with photocopies of a complete run of Belles and Beaux during my research. I am also grateful to the audience at the August 2010 conference of the International Association for the Study of Popular Romance and to the two anonymous JPRS readers for their very helpful comments on earlier drafts of this essay. On the separation of literary “brows” in the nineteenth century, see Brodhead 77-83. On the formal distinctions between dime novels, story papers, and cheap libraries, see Denning 10-12. On Bonner’s success with “romance-hungry” readers, see Mott 358. The Ledger measured approximately 22 by 14 inches (Looby 186); Belles and Beaux, 16 by 11.25 inches (Johannsen 468). Carr speculates that the size of Belles and Beaux may have been a drawback for working class women readers. “The large size of the paper made it hard to carry and difficult to read,” Carr suggests, “matters of concern to working women who often read on their way to work or on their lunch breaks in small rooms or on the streets” (71). Readers who folded the paper in half, however (as is common even with today’s much thicker tabloid papers), would likely have had a manageable object to carry. One striking entry in the second issue of the paper describes the collective suicide of a group of Chinese girls who kill themselves rather than submit to the “slave-like obedience of wives to the wills of their husbands” (“Suicide of Nine Chinese Girls” 14). To take one issue at random, only four of the seventeen topics in the “Random Reading” column of the third number, for example, have any direct connection to love or romance (Belles and Beaux 14 February 1874, 14-15). Although “Poor Wykhoff Jones” credits no author, the poem had previously been published at least twice before, under the popular dime novelist Victor’s name, first in the Cosmopolitan Age (in 1860) and later in Beadle’s Monthly (in 1867). The Poe-esque flavor of this tale may help make sense of a somewhat strange reference in the inaugural issue of Belles and Beaux, the editors’ announcement that “What Poe’s ‘Rare and Radiant Maiden’ was to the world of Poesy, we propose to make this weekly—a rare and radiant creation in the world of popular periodical literature” (“Our Paper” 8). Given that Poe’s “Rare and Radiant Maiden” Lenore, who first appears (unnamed) in “Paean” (1831), then in “Lenore” (1843), and then again in “The Raven” (1845), is both always beautiful and always dead, one wonders whether the editors of Belles and Beaux fully understood the implications of this reference. Or conversely, perhaps the invocation of Poe in the opening issue should have been a signal to readers that death would not infrequently be commingled with love in the issues to come. Later Poe-esque stories to appear in Belles and Beaux would include the two-part tale of horror, “A Mad Night,” by the prolific gothic writer Harriet E. Prescott—better known today by her married name, Harriet E. Prescott Spofford. The anti-romantic elements I have been highlighting are not the same as simply writing about the pain of love. There are many instances of the latter in Belles and Beaux, particularly in the poetry, but even the most despairing of those pieces remain fundamentally romantic. They reaffirm the importance of love by lamenting its loss, rather than insisting on its impossibility. See, for example, S. M. Harper’s “A Farewell,” about a deceiving lover. The final lines of the poem exemplify its overall tone: “Inconstant one, I hate thee now, / So fare thee well forever” (23-24). This promotional copy for the New York Weekly Story-Teller appeared on the back of a piece of collectible parlor music inserted into one of the issues in the first volume. Munro promised readers a new piece of music every three months, suggesting that his paper, at least initially, sought to create a similar sense of “practical romance” as had been encouraged by the editors of Belles and Beaux. The Story-Teller’s editors could not have been more explicit about the age and gender of the intended readership of “Big-Mouthed Billy: One of Our Boys.” The prefatory notice to the story reads: “Every boy who is fond of fun and likes to laugh, should read ‘BIG-MOUTHED BILLY,’ commenced this week in The New York Weekly Story-Teller. This story is intended particularly for the boys, and they must not fail to purchase a copy of this week’s Weekly Story-Teller, containing the opening chapters of this wonderful story” (“Notice” 8). bio: William Gleason is Professor of English and Acting Director of American Studies at Princeton University. He is the author of The Leisure Ethic: Work, Play, and American Literature, 1840-1940 (Stanford University Press, 1999) and Sites Unseen: Architecture, Race, and American Literature (New York University Press, 2011).